A quick glance at this photo makes me think of Heaven. 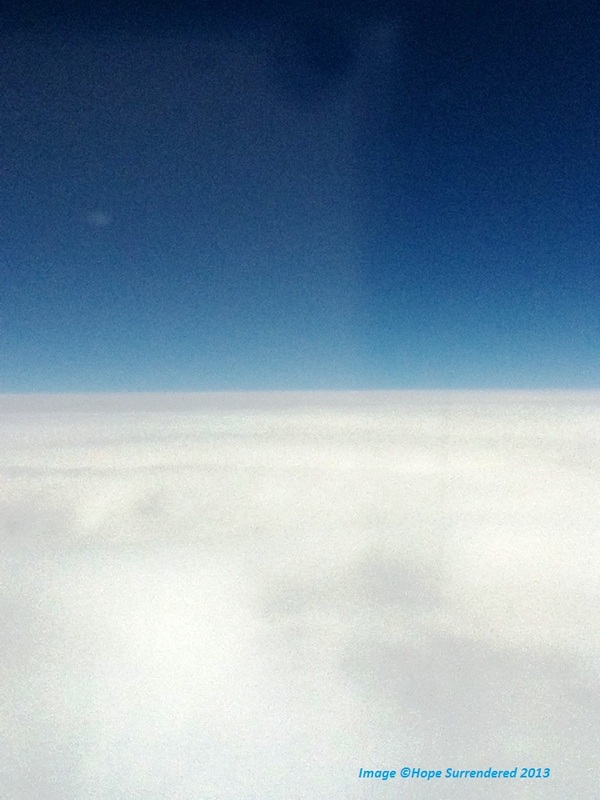 I know the third Heaven looks nothing like this, but flying above the clouds and seeing such a distinct separation of the levels within the first Heaven just makes me think about the second Heaven (where the planets and stars dwell) and then the third Heaven (the beyond-it-all where our Lord dwells). Therefore, I think of Heaven when I see an image like this. Someone I know recently passed away. I know her soul was caught up into the Heavenly realms. She was a Believer, but she wasn’t the kind who just believed; she was the kind who lived life in such a way that others wanted to know from where her strength came. She didn’t hesitate to share the answer with others. She was even doing it in her final moments here on this Earth. She knew — with absolute certainty — where she was headed when she took her last breath. Her passing was sad for so many who had been impacted by her life, but her passing was also a celebration for the many who knew her and the many more who knew of her. When one lives their life in such a way that others want to know from where strength comes, one is living out loud. She lived and loved out loud. I feel part of being able to live that way is knowing about eternity. There is a peace and a calm knowing where eternity will be spent. I feel that peace and calm about my eternity. Do you? You can know, for sure. You can KNOW — with absolute certainty — where you will spend your eternity. When I fly, I love the moment in which the airplane breaks through the dismal, grey clouds to reach the sunshine that waits above them. Sometimes it’s a bumpy ride to the other side, but what is waiting is nearly always the same. I love the times when I can look down and see a fluffy, white carpet of clouds, then look across and see the place where the clouds meet the bright, blue sky. It doesn’t matter what is going on down there underneath the grey clouds, because there, above them, is a different view. It’s a peace and a calm. I am sure some of that was what my friend experienced in her final moments. She had a bumpy ride, but she knew the peace and calm of the other side. She knew the place to which she was headed to spend her eternity.